Hi everyone! I am sorry I have been away. I hope to make some new tutorial posts and also make some posts to show you the projects I have been working on. 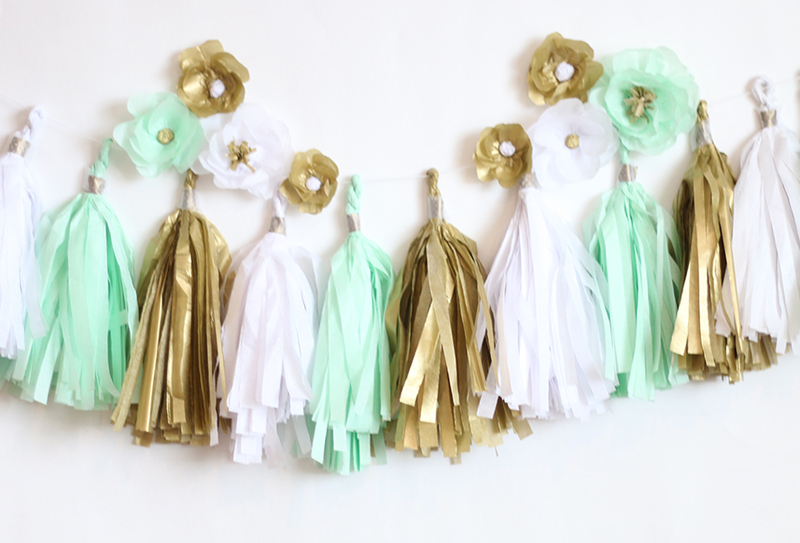 For today, I have a tutorial on how to make this cute tissue paper tassel garland! This garland is made out of tissue paper and is decorated with optional washi tape. It is super easy and fun to make. It would be great for a bridal shower, baby shower, or any party! I added some tissue paper flowers to brighten up the garland as well. I can provide a tutorial for these flowers if anyone is interested! To get the step-by-step instructions, click here to see my tutorial on the Think Crafts! blog. Thanks Brittany! I will try to make a tutorial on them! They’re very easy! I love the colors you chose for this, plus your blog theme is perfect! First time visitor here, I’m so glad I found you at Merry Monday! Thanks so much for stopping by, Kristina! Love this looks so pretty! What a fun idea! I’d love to decorate with these for a bridal or baby shower, or even just throw them up above my couch in my living room! Love the colors you picked too; a great combination! Thanks so much Ariel! They are very fun to decorate with! Thanks for such a great tutorial! These are so fun and festive and can easily be customized for any party or celebration! I love that you added the flowers! Too cute!